Hardman Signs is the Southwestern commercial signs company that the businesspeople of our service area depend on for fast and efficient service. Our trained designers will create the signage that will help your commercial signage gain brand-name recognition and our fabrication engineers will quickly and efficiently manufacture the designs that will catch your customers' eyes. Our commercial sign company is experienced in creating signage for clients across a very wide spectrum of industries - please read on to learn more about our commercial sign services. Business Signs: Showcase your company name in style with a business sign from Hardman Signs. Church Signs: We make banners and more for area churches. Dealership Signs: Trust our commercial signs company with your dealership signage requirements. Gas Station Signs: Gas station signs are one of our most-requested types of commercial signage. Hospital Signs: Our commercial sign company manufactures wayfinding signs and more for hospitals. Hotel Signs: Hardman Signs' commercial sign services encompass hotel sign design and fabrication. 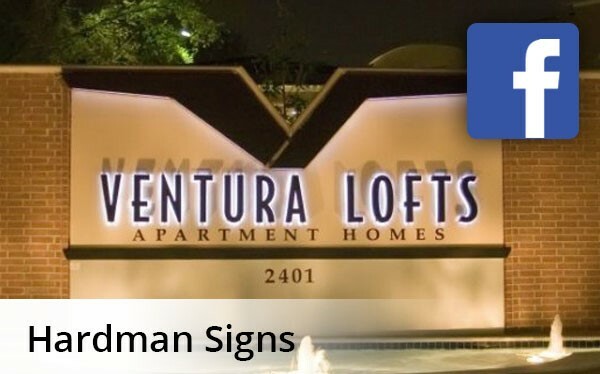 Residential Signs: Contact us with your residential signage needs. Restaurant Signs: Trust us with restaurant sign design and fabrication. Retail Signs: Direct customers around your store or showcase your brand name with Hardman Signs retail signage. School Signs: Schools and universities across the Southwest call Hardman Signs for sign design assistance. Sports Stadium Signage: Keep your team's name in lights with signage from Hardman Signs. Houston Commercial Signs: Contact Hardman Signs for top-quality Houston commercial signs. Austin Commercial Signs: Our Texas signage company is proud to provide the commercial sign design and fabrication services that Austin's businesspeople need. Atlanta Commercial Signs: Turn to Hardman Signs for assistance with Atlanta commercial signage. ...So contact us today! Fill out our quick quote form to receive your no-obligation estimate or call the commercial signs experts at Hardman Signs today.